Smashing Pumpkins livestreaming concert from Seattle on Twitter | The Music Universe - Pop It Records - NEW MUSIC EVERYDAY! The Smashing Pumpkins will be livestreaming the Seattle stop on their Shiny And Oh So Bright tour The Live Nation Concert series on Twitter, Friday, August 24th at 8:15 pm PT. The livestream can be viewed at live.twitter.com/thesmashingpumpkins. Fans outside of the US can access the livestream here. The Smashing Pumpkins are currently on the road for their Shiny And Oh So Bright North American arena tour. Produced by Live Nation, the tour is the band’s first in nearly 20 years to feature founding members Billy Corgan, Jimmy Chamberlin, and James Iha. Longtime Smashing Pumpkins guitarist Jeff Schroeder, bassist Jack Bates, and keyboardist Katie Cole round out the lineup. Critics were quick to praise the tour’s opening dates as “a massive gift to their fans” (Uproxx), “a triumphant performance” (Arizona Republic), and “an uplifting spectacle” (Loudwire). Tickets for the tour’s remaining dates are available now. Earlier this month, the band celebrated its 30th Anniversary Performance with two shows at PNC Bank Arts Center in Holmdel, NJ. AFI frontman Davey Havok, Joy Division and New Order bassist Peter Hook, Killers members Dave Keuning and Mark Stoermer, Courtney Love, Mark McGrath, and Deftones frontman Chino Moreno were all part of the momentous occasion. 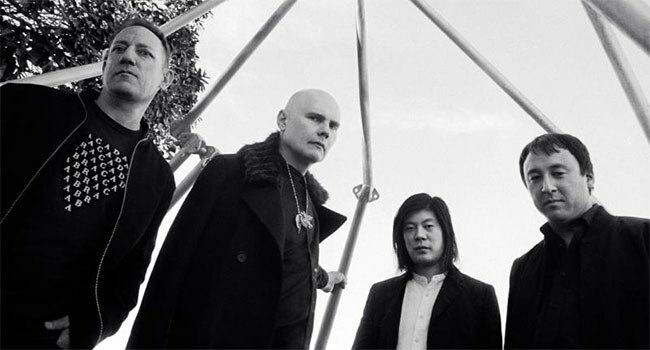 Earlier this summer, The Smashing Pumpkins dropped “Solara,” the first recording in over eighteen years to feature founding members Billy Corgan, James Iha, and Jimmy Chamberlin, as well as Jeff Schroeder. Recorded in Malibu, CA at Shangri La Studios with producer Rick Rubin, “Solara” is available now to stream and download on all digital music platforms Martha’s Music under license to Napalm Records. The track’s dreamlike music video was directed by Nick Koenig and expands on the theatrics of the band’s catalog of iconic music videos.